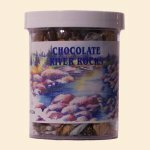 Chocolate River Rocks are a Northwest Specialty created for the Chocolate Lover, using the shapes and colors of river rock found in the majestic rivers of the Rocky Mountains. Real Milk Chocolate with a Candy Shell. Great gift for any angler. Great stocking stuffer and anchor for balloon bouquets! Shapes & colors of real river rocks. Ingredients: Sugar, cocoa paste, whole milk, maltodextrim, calcium carbonate, lecithin, artificial colors (Blue #1, Blue #2, Yellow #5).